But Confederate fortunes had reached their high tide. 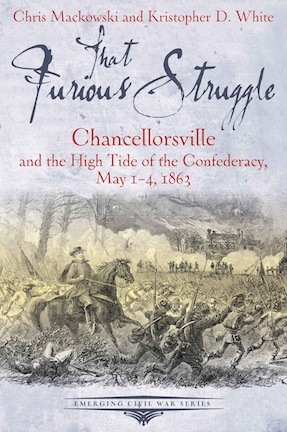 Never again would fortune favor Lee the way it did at Chancellorsville—though the war would continue another two years. Authors Chris Mackowski and Kristopher D. White are cofounders of Emerging Civil War. Together, they have co-authored half a dozen books, and their articles have appeared in Civil War Times, America’s Civil War, Hallowed Ground, and Blue & Gray. Chris is a professor of journalism and mass communication at St. Bonaventure University in Allegany, NY, and historian-in-residence at Stevenson Ridge, a historic property on the Spotsylvania battlefield. Kris is historian for the Penn-Trafford recreation board and a former Licensed Battlefield Guide at Gettysburg. Both have worked as historians at Fredericksburg and Spotsylvania National Military Park.